Monarch Pass, Colorado, USA: It’s nice to know there is a place for out-of-control semis to go, but there’s something a bit unsettling about seeing a sign like this. 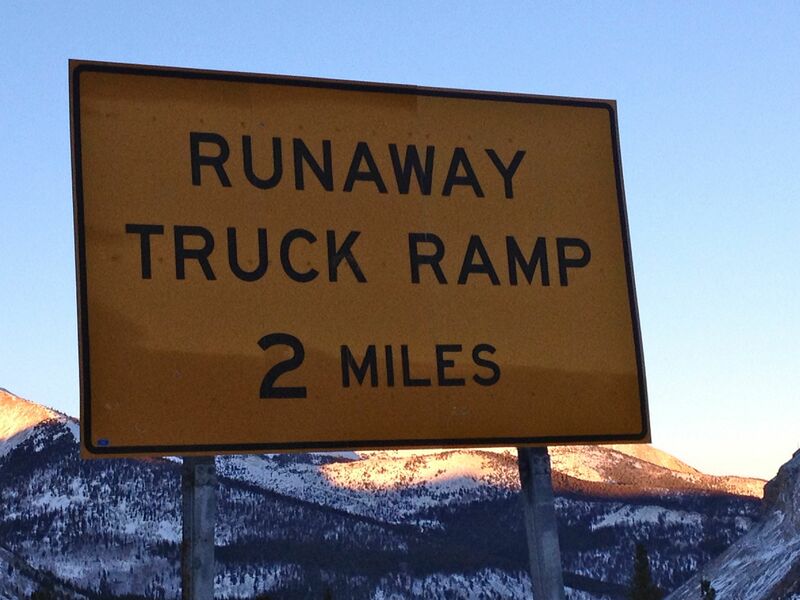 First of all, there is a reason for a runaway truck ramp — because there are runaway trucks. Secondly, a lot can happen in two miles when a truck has brake failure — especially on a narrow mountain pass with one side that drops off substantially. It’s really unsettling to see tracks on the runaway truck ramp! 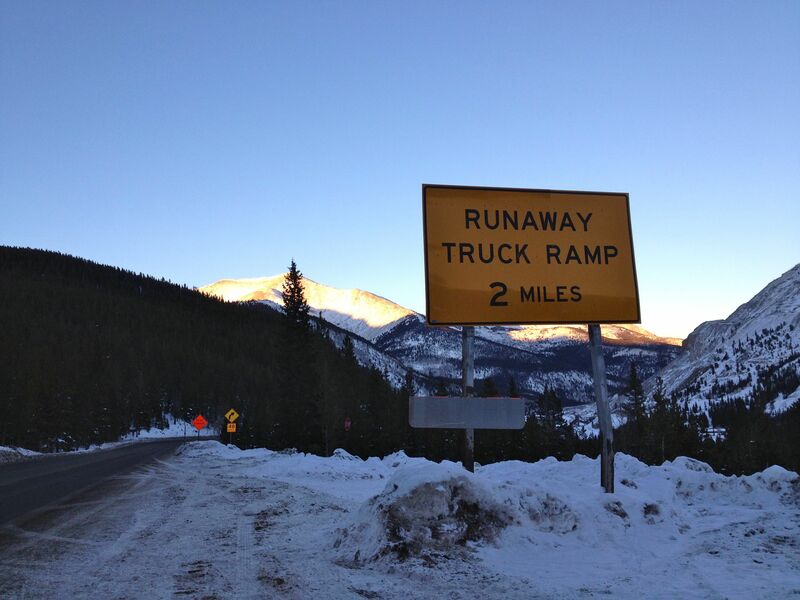 This entry was posted in Colorado, Funny signs, Humor, Mountains, Travel, Travel Oops and tagged Mountain driving, mountain warning signs, runaway trucks by stephglaser. Bookmark the permalink. Steph, my brother drove a truck in the past, and has been in one of these runaway ramps. The report from him is that it definitely is NOT fun, but it’s so much better than the alternative. BTW, love the sign category. 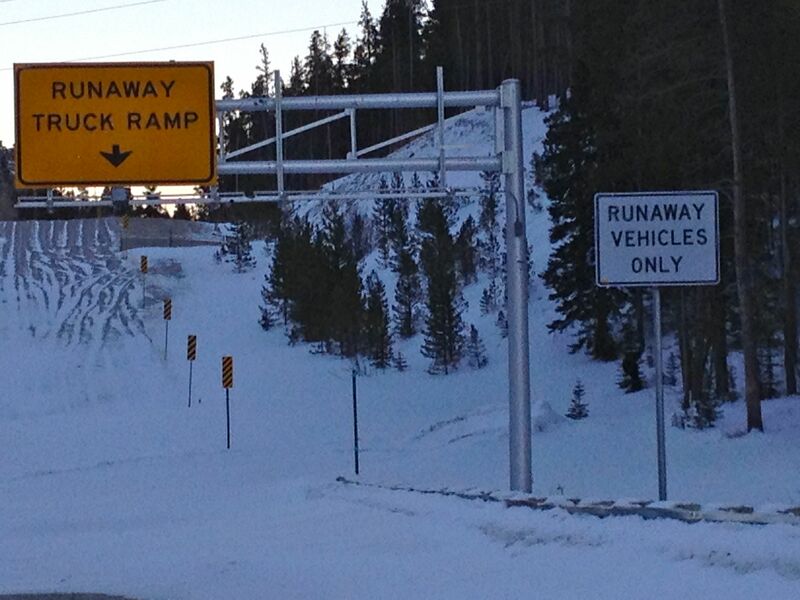 Whoa…I can’t imagine how scary it would be to use a runaway ramp! I’m glad your brother is okay (?). You are so right — definitely, a ramp is way better than going off (gulp) the side. I’m so glad you like the sign category — I realized that I had been taking photos of funny signs before I even started the blog and they just seemed like a natural addition to blog with a travel humor theme!